Samsung Techwin America has just unveiled an outdoor 3 megapixel network video surveillance camera complete with a 30 meter IR range in total darkness. The camera is labeled as the SNO-7080R and comes with a 2.8x varifocal motorized zoom lens and is capable of capturing 16:9 full 1920 x 1080p HD with wide dynamic range and features a dual H.264 and MPEG codec. In addition to that, this camera also uses Samsung’s WiseNet2 DSP chipset, which is designed to provide maximum benefit for megapixel technology. This includes Wide Dynamic Range and Smart Compression with region-of-interest (ROI) encoding. H.264 compression also ensures that your images are high-res and work well with your bandwidth while the H.264/MJPEG dual codec supplies multiple streaming. The SNO-7080R also offers multiple resolution options including CIF, full 1080p HD and full 3 megapixel with the ability to transmit as many as six different profiles for viewing and recording. The camera also has an IP66 environmentally rated housing for severe weather conditions and can be powered with an Ethernet cable and 24V AC. This camera is also ONVIF-compliant and features backlight compensation, SSNRIII (2D+3D) digital noise reduction, motion detection, privacy, SSDR for contrast enhancement and auto day/night (ICR). The 3-8.5 millimeter motorized varifocal lens also allows remotely adjustable zoom and focus settings for a fully customizable setup. 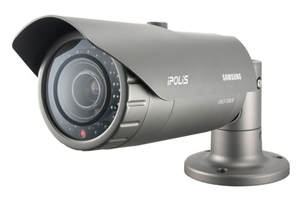 If you’re looking for a solid, outdoor IR bullet camera, Samsung’s SNO-7080R just might be the bullet camera for you. You can check it out on Samsung’s security camera webpage.